Attendance system offers easy-to-use, proximity technology. Simply wave the proximity card in front of the terminal and to clock in and out. 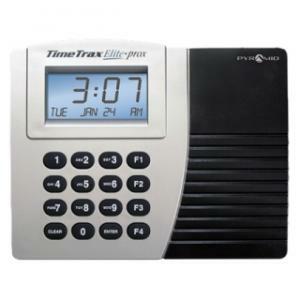 TimeTrax Prox system is Ethernet LAN-compatible with multi-time zone functionality and has a battery backup memory. Standard capacity of 50 employees is expandable to 6,000. Exporting capability to major payroll systems includes ADP, PAYCHEX, QuickBooks, and more. Unlimited, overtime rule configurations include time-and-a-half, double-time, special Saturday, Sunday or seventh day overtime work rules. Attendance system accommodates weekly, biweekly, semimonthly, and monthly payrolls. System includes 15 proximity badges and the TimeTrax Software.